A pair of Fabulous Italian Cypress trees make the perfect display either side of gates, doorways, porches. 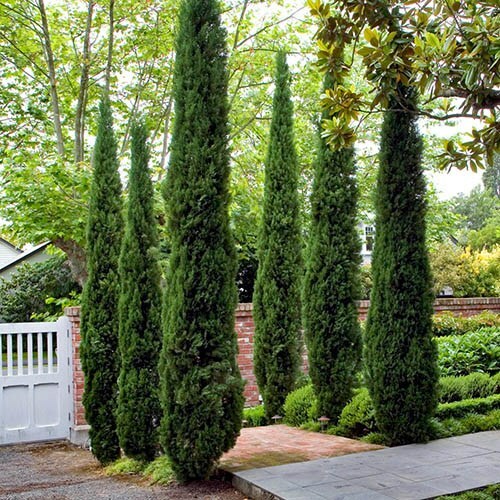 Stylish and evergreen, these cypress add height and interest - even when space is limited. Very easy to grow, these pencil-slim conifers are widely used in Mediterranean gardens. Tough and hardy here in the UK, they grow reasonably quickly (15-25cm a year), in big pots or direct in the garden. Treat yourself to a pair of these gorgeous Italian Cypress trees, and add a touch of Mediterranean class to your garden. Seen all over Italy, these spectacular architectural conifers will add height and year-round interest wherever you plant them. With their elegant, pencil thin form, they'll look simply stunning framing a door or gateway, or in a terracotta pot. Not to be confused with vigorous Leylandii these slender, manageable beauties are slower growing and won't get out of hand you can even grow them on your patio! They are of course very drought tolerant, but also completely hardy and evergreen, so they'll thrive here in the UK and look magnificent all year round whatever the weather! For best results, remove the cones that appear, as these can pull the branches apart, losing shape. Add a flavour of Mediterranean gardens right here at home. Supplied as a pair of Italian Cypress (Cupressus sempervirens Pyramidalis) trees in 14cm diameter pots. Total height now: 80-100cm total inc. pot. Plant your cypress trees where they can get full sun and in well-drained soil. If using a container, a sol based potting compost is ideal. Dig a planting hole larger than the root ball of the cypress tree and add organic matter into the hole. We recommend the use of mycorrhizal fungi when planting. Place the tree into the hole and backfill, ensuring that the stem is at the same level as when it was in the pot. Press the soil firmly around the base of the tree’s trunk. Water thoroughly. You need to water the tree regularly for the first two growing seasons. Once established, this tree is drought tolerant. Container plants will need regular watering. After first planting, mulch with 2-3 inches of organic matter to retain moisture in the soil and prevent competition from weeds. Annual maintenance is easy, simply check for any damaged or dead growth and prune as necessary.